Well, its has been quite a while since I made my last blog post. Well , I decided to take a small break in order to come up with fresh, and hopefully better ideas. During the short break, I made a tragic mistake of visiting the drought ravished ukambani area. What I saw during this short visit made my heart leap out of my mouth (as my English teacher would have put such feelings that i felt). It made me almost give up on the meaning of life in this blessed country of ours. I mean, whoever came up with "kazi kwa vijana" must have been a big idiot. 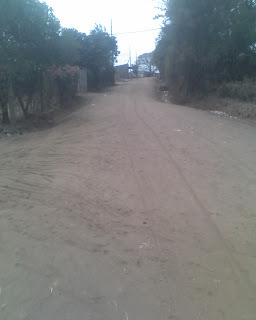 Yeah, the roads looked neat with all the work that Kazi kwa vijana had done, but rather than applaud them, their results sickened me. It reminded me of a certain college class in which we covered ethics and the issue of jobs left when machines take over jobs done by people. I didn't have the slightest idea that I would live to see a day when hundreds of men would take over a job meant for one machine known as a grader, or commonly referred to by its brand name, caterpillar. The Kazi Kwa Vijana project was developed to replace work easily and cheaply done by machines with mass manual labour. It was meant to counter the massive unemployment in Kenya. Whoever came up with the idea of demechanization must be confined to mathare mental hospital. So what other solutions will this genius come up with to solve the country's problems. I presume that soon, mechanized tarmacking will be a thing of the past. We will see hordes of vijanas manually tarmacking our highways, like they once did when they first built the Thika- Garissa Highway (Well, my father says it was built by hand; this may also have inspired Ken-wa-maria to come up with the song "Germany by foot" given that he hails from the area )This will surely solve our unemployment problem. As for time taken, there is a contractor on some stretch of the Nyeri highway who is almost clocking the equivalent number of years that it took to hand build the Thika-Garissa , yet we still put up with him. As for the ongoing power rationing, occasioned by 4 years of insufficient rainfall, we can develop hand operated dynamos to generate electricity. This earth-shattering project can then be proudly powered by the vijana from our Kazi kwa vijana project. This should produce enough electricity to meet and exceed our demand. This will beat the diesel generators that we usually procure at short notice whenever we are in the midst of a pre-predicted crisis. Let us wait to see what other tricks the kazi kwa vijana pull out of their magic hat. The kazi kwa vijana roads project happened to unearth another critical issue as they worked on the earth roads. They ended up unearthing water pipes , and breaking the ones they did not unearth. How many water supply companies in the rural areas use plastic pipes as water pipes. Last time I checked, this pipes were meant for electric wiring in buildings. Whoever decided they made permanent replacement for water piping, must be another idiot. We now have to dedicate whole departments to plumbing burst water mains, and this is despite the fact that such pipes buried a few cm off the ground. Surely, what ails us? on-road rally. 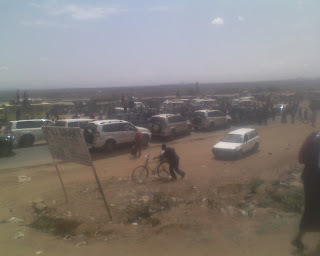 Our vice president had decided to stop and address his loving subjects right in the middle of the Garissa highway. His VIP motorcade was then arranged on the highway to ensure that other motorists had the privilege to use the trenches on the road shoulders, weaving through the crowd that he had attracted. Long live the VP and his road etiquette.